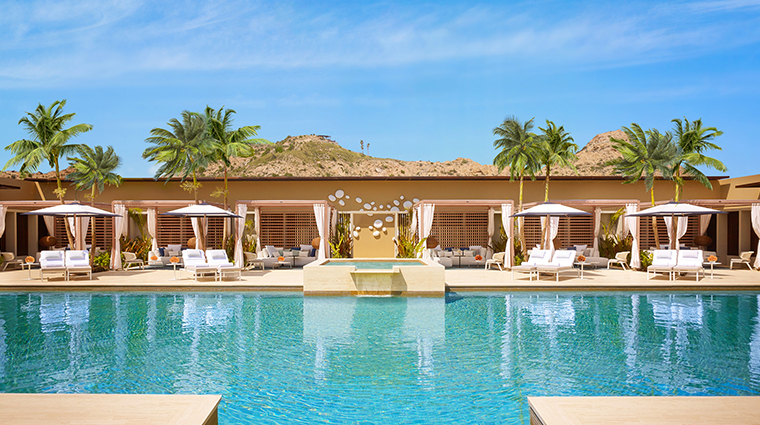 The first thing you’ll notice about Spa Montage Los Cabos is its sheer size: at 40,000 square feet, it’s the largest spa in a destination famed for its exhaustively appointed wellness facilities. The adults-only serenity pool, for example, is so enormous it could easily be the main pool at a smaller resort. The beauty salon, too, is impressively expansive, as are the hydrotherapy areas — steam rooms, hot and cold plunge pools — and tranquil garden lounges. But details also impress, and the soothing services are, ultimately, the primary attraction. Pampering includes facials and body treatments, manis and pedis, romantic couples’ services and vitality experiences that can be enjoyed by the beach or pool. A 24-hour fitness center also shows off state-of-the-art equipment and first-class service, while the lifestyle boutique offers leisure clothing and upscale health and beauty products. Not only will you feel your best after a visit to Spa Montage, you’ll look your best, thanks to the onsite beauty salon. The serene spot specializes in fashionable haircuts and styling — including hair and makeup for destination brides — but also excels at manicures and pedicures. 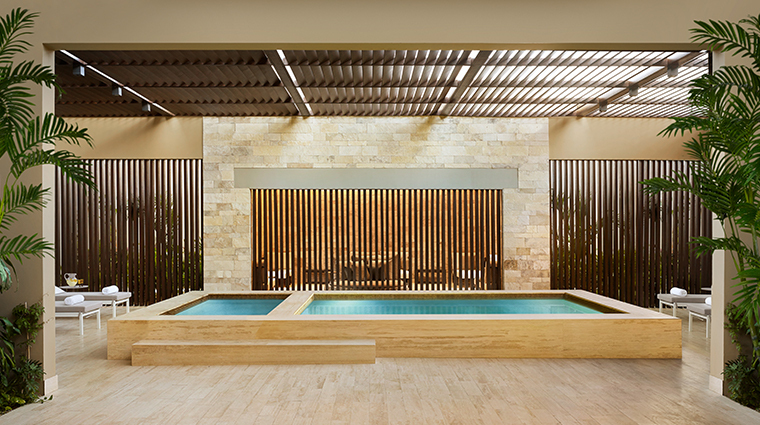 Spa Montage Los Cabos is the largest wellness center on the Baja California peninsula, with 40,000 square feet of treatment rooms, salon facilities, hydrotherapy stations and other relaxation areas. Get your morning stretch courtesy of regularly scheduled yoga classes, offered six days a week. Other guided fitness activities include Pilates and a beach boot camp. The well-stocked boutique offers an excellent selection of resort clothing and accessories, plus beauty and health care products from top brands like Kérastase, Osea, Jack Black and Lola’s Apothecary. The serenity pool is the only swimming hole on the property specifically restricted to adults. It’s very large — the size of many resorts’ main pools — and is outfitted with private cabanas for maximum shade and seclusion. Like most regional spas, Spa Montage offers romantic “just for two” treatments for couples. Unlike most, however, this luxurious facility will customize any of its standard massages, treatments, therapies or rituals to accommodate your and your partner’s specific preferences. Spa services are available to all guests 16 years and older, but younger visitors are welcome to enjoy treatments as long as they are accompanied by a parent or guardian. A dedicated menu of treatments for teens ensures that even younger spa-goers can indulge in a little age-appropriate pampering. The Balancing Facial, for example, helps clear adolescent complexions with gentle exfoliation and a customized mask. 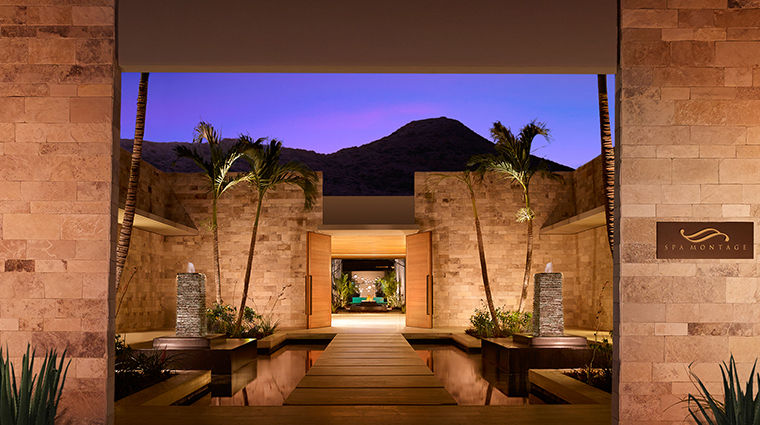 Stress-relieving, circulation-enhancing massages are at the heart of any wellness center’s offerings, and Spa Montage boasts an impressive array, from the Baja Relax using Swedish techniques to the Mezcal Renewal that incorporates essential oils and not-so-essential — but nonetheless enjoyable — spirits. Ancient Mexican folk wisdom meets regional ingredients in unique body therapies like Crystal Flowers of the Sea, a relaxing 60- or 90-minute ritual that begins with agave-fiber body brushing and concludes with a skin-freshening exfoliation utilizing crystal sea salts infused with seaweed and fresh fruits. Several facials feature branded organic skincare products from Tata Harper. Skin-focused therapies like the Gentlemen’s Barber Facial have also proved popular with resort guests. Specific body areas — think hands, neck, arms and feet — are targeted in shorter, more focused beach and poolside vitality massages. 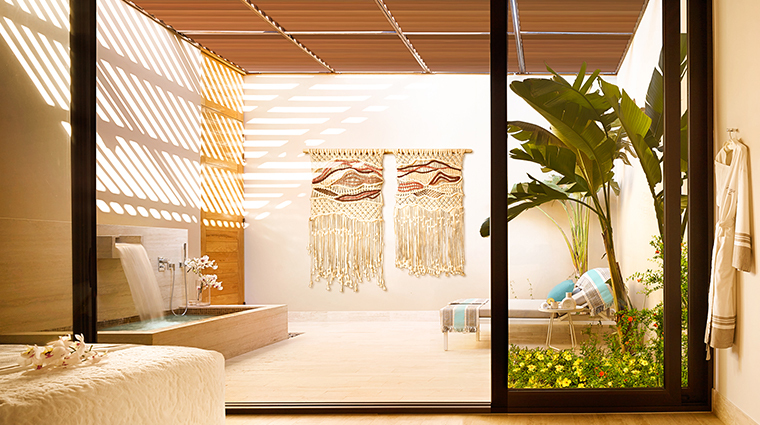 Montage Los Cabos' spa is a showcase for dramatic design elements. The entrance features a stepping stone pathway through a clear water lagoon, and the long walkway to the serenity pool is highlighted by a gorgeous central fountain. The locker rooms are larger than those at most health clubs, and are outfitted with an indulgent selection of beauty products, from shaving creams and gels for men to skincare and makeup for the ladies. The well-appointed gym is open around the clock with the latest in cardio equipment and Synrgy360 resistance machines, plus refreshing extras like juices and fruit-infused water.